Eschew the tourist crowds and head to Room Escape Games and Sipoonkorven Kansallispuisto. 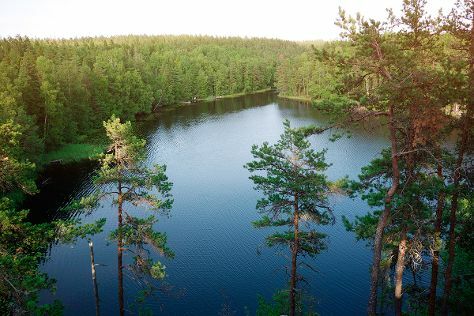 Escape the urban bustle at Nuuksio National Park and Arctic Expedition. Go for a jaunt from Helsinki to Porvoo to see Porvoo Old Town about 50 minutes away. Next up on the itinerary: take an in-depth tour of Seurasaari Island and Open-Air Museum, admire the masterpieces at Kansallisgalleria, sample the tasty concoctions at Stadin Panimo, and wander the streets of Ullanlinna. For ratings, traveler tips, and other tourist information, read our Helsinki holiday maker website . Brussels, Belgium to Helsinki is an approximately 5.5-hour flight. You can also do a combination of train and flight; or drive. The time zone difference when traveling from Brussels to Helsinki is 1 hour. In April, Helsinki is slightly colder than Brussels - with highs of 9°C and lows of 0°C. Wrap up your sightseeing on the 23rd (Tue) to allow time to travel back home.